Our Metaboost Formula is designed to bolster our patients metabolic resources and help them balance blood glucose levels. This modern formula is designed to bolster our patients metabolic resources. We use modern research as a basis for helping our patients support some common issues such as fatigue, cholesterol and blood glucose imbalances, and digestive difficulties. I used Metaboost after gaining weight while on an extended vacation. Combining Metaboost with exercise, it felt like the weight came off easier then it has in the past. And I had no cravings for sugar, which I was struggling with before. 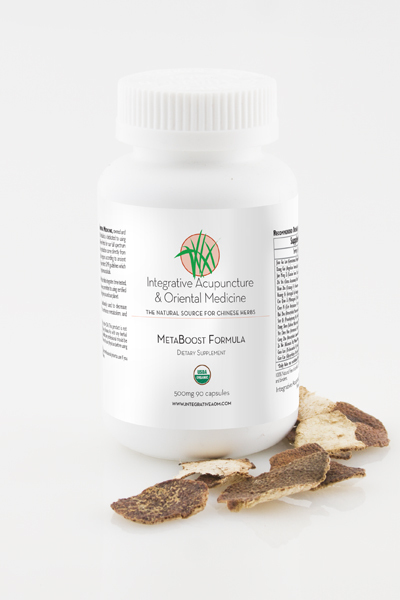 Greta P.
Metaboost helped me regain balance with my digestion and after my second child. My cravings were out of control in the evenings and i feel this formula helped me get back in balance with my nutrition. Kate B.
Organic Southern Ginseng (Jiao Gu Lan), Organic Angelica (Dang Gui), Organic Cassia Seed (Jue Ming Zi), Organic Bitter Orange Peel (Zhi Shi), Organic Hawthorn Fruit (Shan Zha), Organic Astragalus (Huang Qi), Organic Plantago Seed (Che Qian Zi), Organic Orange Peel (Chen Pi), Organic Atractylodes (Bai Zhu), Organic Pseudoginseng Root (San Qi), Organic Codonopsis Root (Dang Shen), Organic Artemisia Leaf (Yin Chen Hao), Organic Atractylodes Tuber (Cang Zhu), Organic Water Plantain (Ze Xie), Organic Snakegourd Fruit (Gua Lou), Organic Licorice (Gan Cao). Jiao Gu Lan also known as Gynostemma grows throughout China, Korea and Japan. It contains over 80 compounds called gypenosides that are similar to those found in ginseng and astragalus. Traditionally it is used to strengthen the body and for chronic asthma, neuralgia, and migraines. It has recieved major interest by researchers in recent years for its ability to reduce cholesterol and combat cardiovascular disease. Other studies have also shows its efficacy in anti-aging, gastritis, headaches, and cancer. It is very safe and widely used in Chinese herbal formulas. Radix Angelicae Sinensis, Angelica, has a special affinity for female gynecological disorders. It is known to help balance hormone levels, strengthen the endocrine system. Additionally, Angelica relaxes smooth muscle tissue in the body and increases circulation. In Chinese medicine terminology, it enriches and moves blood. Cassia seeds are from the Cassia plant. Cassia is an annual and grows in tropical regions. Its seeds can be used raw or lightly fried. Cassis seeds are sweet, bitter, and salty. They can help support healthy elimination by moistening the bowel and reducing high blood pressure. Cassia is also used in formulas that support healthy eyesight because it elimates heat from the head that can cause light sensitivity, dry, red, itchy, and painful eyes. Cassia seeds are most often used in combination with other herbs. Bitter orange peel is from the immature bitter orange. It is used for a variety of digestive complaints, most notably bloating, indigestion, gas and belching. It ifluences the spleen and stomach which are the two main digestive organs in Chinese medicine. It helps transform phlegm which can contribute to the feeling of bloating, epigastric fullness and pain. Hawthorn fruit is both sour and sweet. It grows on the Harthorn tree also known as mountain hawthorn or Chinese haw, Crataegus pinnatifida. It is used in both eastern and western herbology to treat heart conditions such as hypertension, angina, high cholesterol. It improves digestion of fatty foods treats ingigestion, distention and diarrhea. 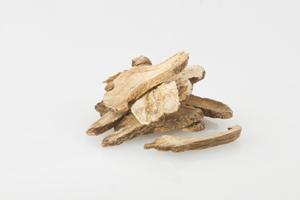 Astragalus, in Chinese medicine, is the number one immune booster and an important tonic herb. A tonic herb means that it helps strengthen the body against disease. It can help the body adapt to any kind of stress. Astragalus raises yang qi in the body. When we don’t have enough yang energy in the body we feel cold, tired, and withdrawn. We may get sick often or have a lack of appetite. It helps modulate the immune system and boost antibody production. Chen Pi is sundried mandarin or tangerine peel. Almost everyone has enjoyed a nice juicy orange but not many know of the peels medicinal quality. It’s taste is pungent, and bitter and it has a warming quality. Orange peel strengthens the digestion through it effect on the spleen and stomach. Physiologically is increases digestive secretions to improve digestive function. Its volative oils reduce gas and bloating. The root of atractylodis is known as Bai Zhu. It is one of the most used and loved herbs of the Chinese pharmacopeia. It is an important herb for strengthening the spleen and stomach meridians. In Chinese medicine, it is used as a Qi tonic. This category of herbs helps treat mental and physical fatigue. Atractylodis strengthens the digestive system and regulates blood sugar. Our digestive function and blood sugar both have a profound effect on our energy level (qi). It also has a diuretic effect which makes it useful for the treatment of edema. Raw pseudoginseng is widely known for it ability to stop bleeding both intern and external. It is a useful herb for traumatic injuries of any kind. When it is cooked it has more nourishing effects and can be used to enhance adrenocortico hormone that helps regulate blood sugar and metabolism. It is used widely in conbination with other herbs to reduce the risk of cardiovascular disease, heart attack, and stroke because it lowers serum lipid levels, cholesterol and capilary circulation. Codonopsis is known as “poor man’s ginseng” becasue it is sometimes used as a cheaper replacement for Panax Ginseng. After the Chinese Revolution in 1949 Codonopsis replaced Panax Ginseng almost completely in herbal formulas as the later was reserved solely for export. 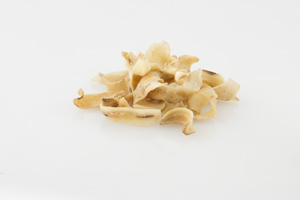 In Chinese medicine codonopsis is a major tonic for nourishing vitality and energy. It is used to strengthen the Spleen and lung qi. These organs are important for energy (qi) production. The food we eat and the air we breath are transformed into nourishment by these two organs. Studies support the traditional use of this herb for liver health. Artemisia leaf, also known as Oriental wormwood has been shown to improve hepatic trigylceride metabolism. It helps lower blood lipid levels which are often high when metabolic stress or deseases are present. 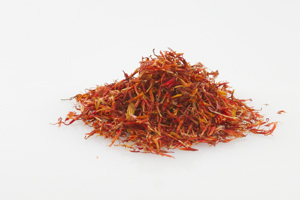 It is bitter, spicy and cool in nature and is associated with the liver, gallbladder and spleen meridians. Cang Zhu refers to the red atractylodes. 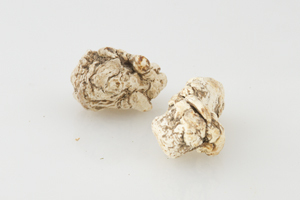 Bai Zhu refers to the white variety. This variety of atractylodes is used for digestive complaints such as abdoinal fullness, lack of appetite, and diarrhea. It dries dampness in the body. Dampness is like a swamp, nothing moves. Edema is a great example of excess dampness. Atractylodes supports metabolic health by strengthening the spleen and stomach and resolving dampness. Water Plantain is found in marshes throughout central Asia. The root is soaked in water, cut and sun dried. It is mainly used to treat urinary issues such as difficulty urinating and urinary tract infections. Water plaintain helps reduce edema and eliminate excess water weight. Snakegourd Fruit is the dried mature fruit of the Trichosanthes kirilowii Maxim or Trichosanthes rosthornii Harms. It is also known as Chinese cucumber because it grows on a long vine. It has long history of being cultivated in Chinese coutyards. The taste of snakegoard fruit is bitter which clears heat and stimulates digestion. It is helpful for conditions such as diabetes, constipation as well as chest congestions with a cough. Our Metaboost is designed to be taken for longer periods. Always consult your healthcare professional with questions regarding dosages.